Our Community Tables and Working Groups have finalized our Workplan. It highlights our prioritized investments in People, Places and Processes over the next three years. The Workplan reflects months of conversations and meetings, and has been influenced by national and local plans and research and, most importantly, community stakeholders’ feedback. 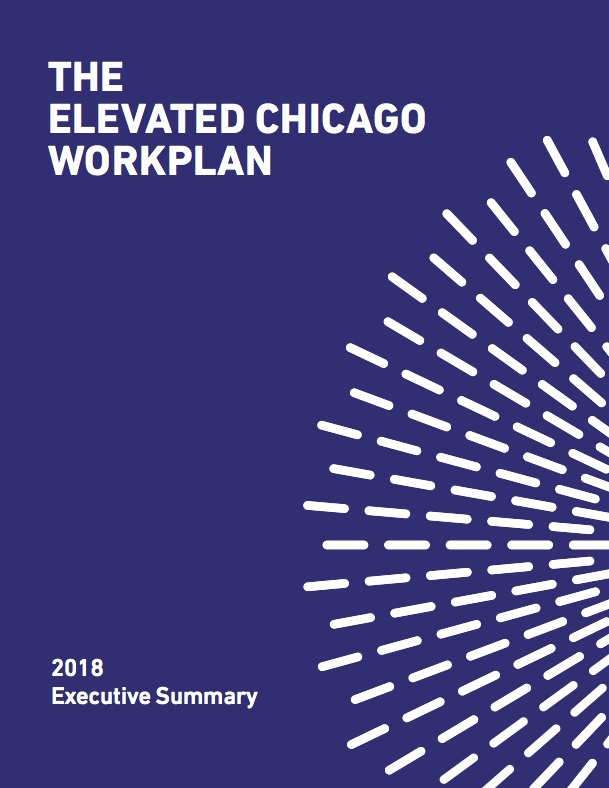 We believe impactful capital investments and programing, paired with systemic policy and narrative change will positively impact the seven communities where Elevated Chicago works. 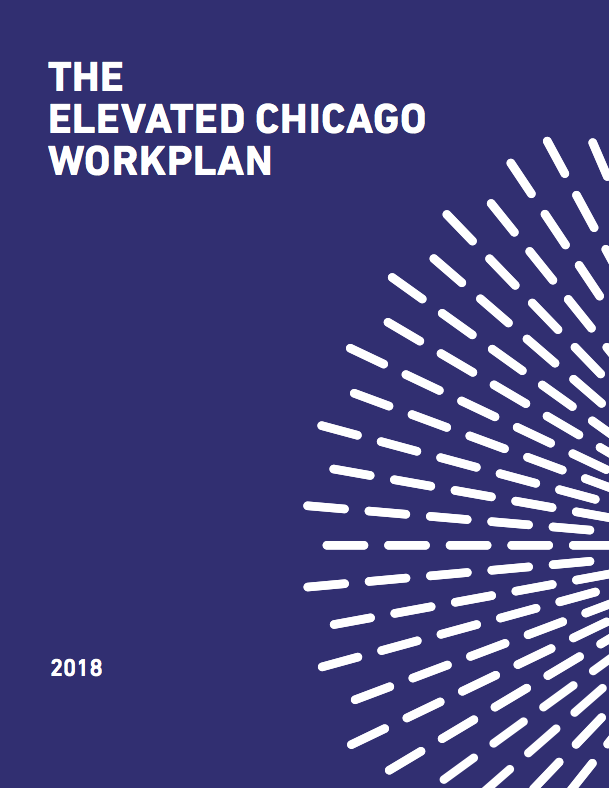 Now and through 2020, our Community Tables will leverage existing resources to activate the people, places and processes necessary to drive racially equitable transit-oriented development (eTOD) in Chicago. We are focusing on neighborhood residents and business owners, particularly those within the ½ mile radius of each station, and/or others with a close relationship to this area (for example, participants in community programs, regular visitors or daily commuters). 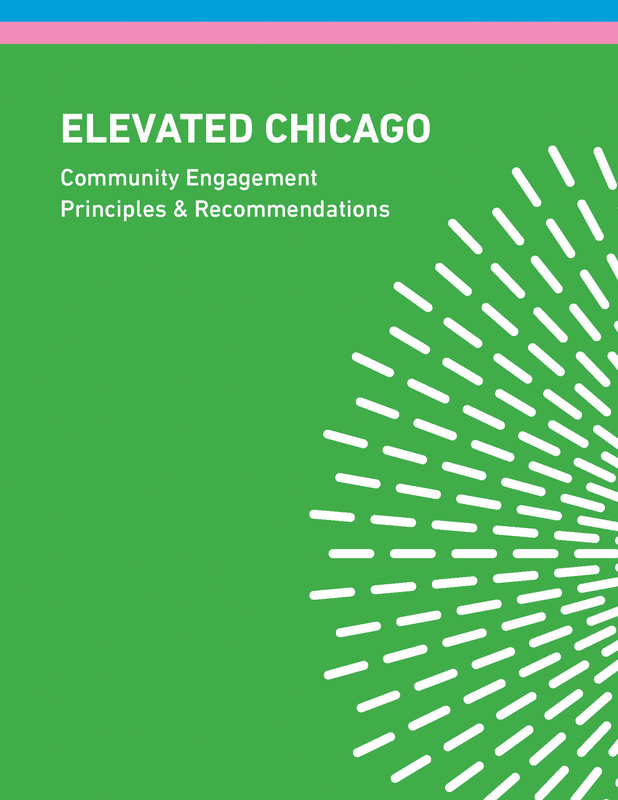 We envision authentic, inclusive, and effective community engagement, power, and ownership, and increased resident capacity to participate in built environment decision making, advocacy, and mutual education with decision makers and investors. 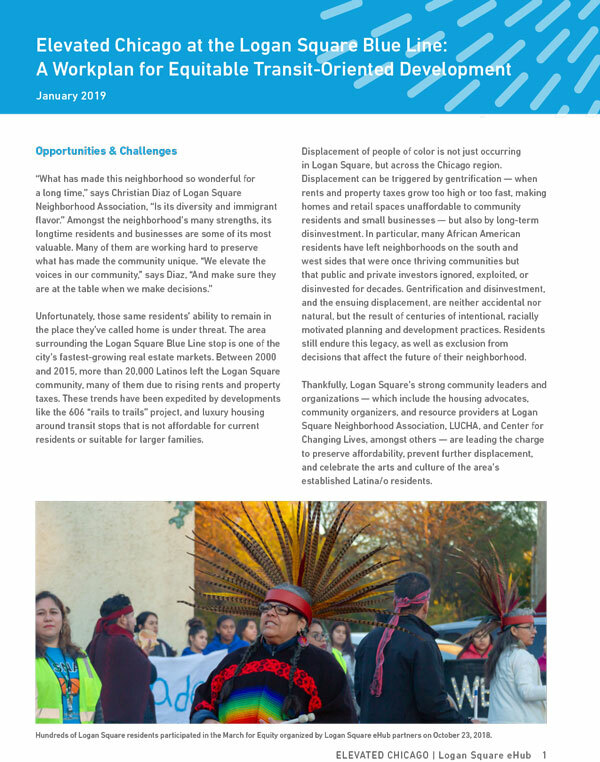 Our strategies include capacity building; fostering local ownership, including of land, homes, and businesses, as well as a broader sense of community ownership of public spaces and neighborhood assets; and amplifying resident power. 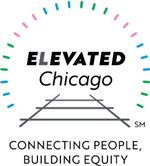 A cross-site “Hearts & Minds” campaign, initially envisioned at the Logan Square Blue Line eHub, which will promote awareness about displacement and foster more positive relationships between longtime and current residents, while supporting resident and business retention across all Elevated Chicago’s eHubs.  Ongoing services provided by Elevated Chicago’s partners (e.g. homeowner assistance and foreclosure mitigation, immigration law, etc. ), which are helping meet residents’ immediate needs and enable civic participation. 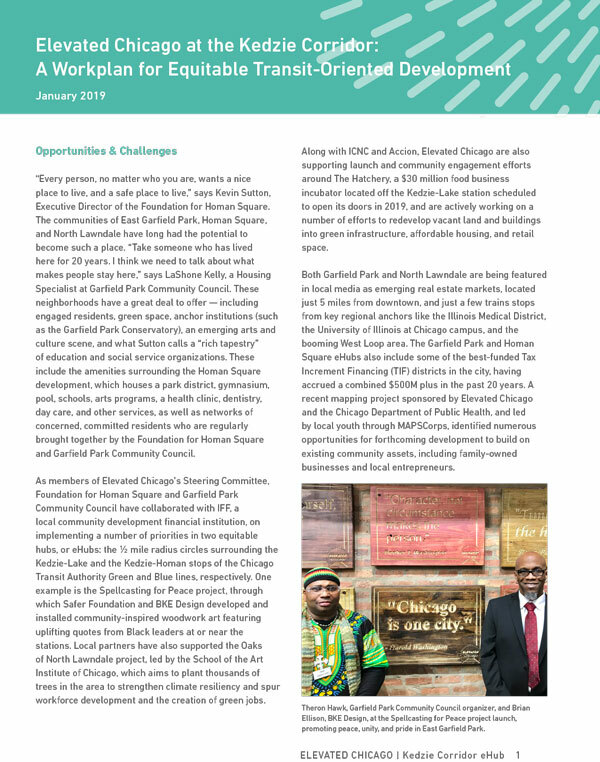 At multiple sites, organizations are building the capacity of residents to provide informed feedback on zoning, anchor institution hiring policies, and other community development decisions, with partners like LUCHA and Logan Square Neighborhood Association paying special attention to youth engagement. 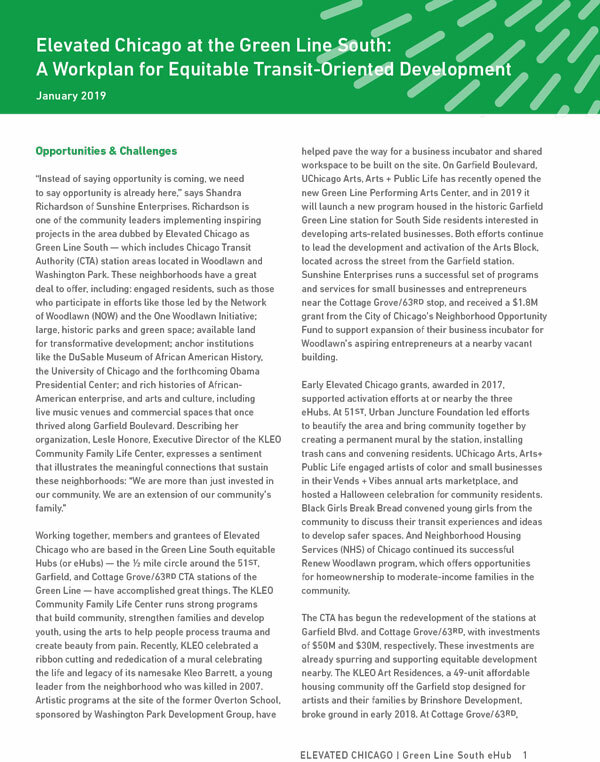 Two business incubators proposed for the Green Line South eHubs, and entrepreneurial counseling led by Accion Chicago in collaboration with Garfield Park Community Council at the Kedzie Green Line eHub, are promoting ownership of businesses by current and longtime residents. 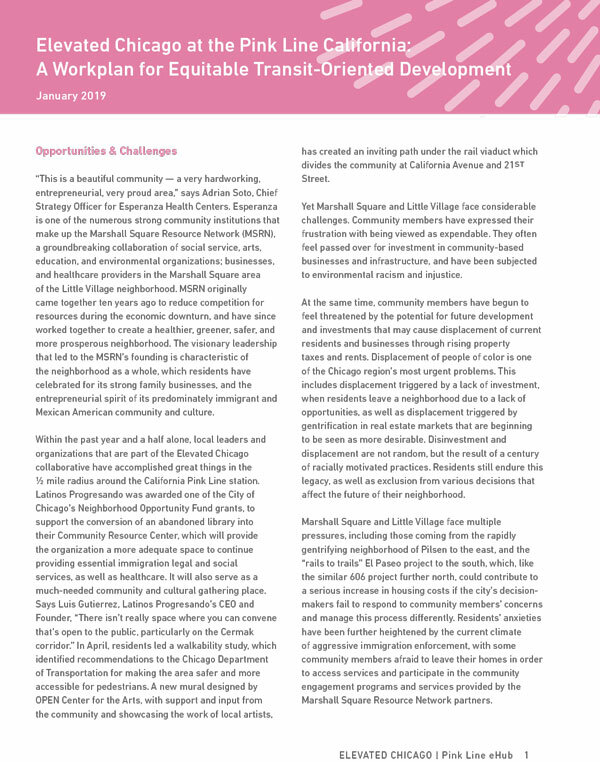 The Logan Square Blue Line eHub is pursuing an innovative collective land ownership model that has the potential to be expanded across sites. We are addressing the built environment in the ½ mile radius of each station. We envision vibrant neighborhoods where the built environment and infrastructure drive equitable outcomes for health, climate, and cultural resilience. Our strategies include the creation of accessible green space and infrastructure for health and climate resilience; transit-oriented community spaces that enable resident engagement and cultural vibrancy; and healthy, green affordable housing. Cultural and Climate Resiliency projects have been implemented in the Kedzie/ Homan, Logan Square, California, and 51st St eHubs bringing together artists, environmental experts, and community to install art and green infrastructure, such as bioswales, community gardens, and trees. These projects will be expanded and integrated in an EcoDistrict model. Our pipeline of inspiring capital projects includes efforts as diverse as the Latinos Progresando Community Center — a dynamic space that will provide legal, health, cultural, and other services to residents at the Pink Line California eHub; the redevelopment of the Overton School into an incubator for small businesses and neighborhood entrepreneurs in the 51st eHub; the C40 development, which will provide affordable, environmentally sustainable housing in the Kedzie Corridor; and a number of interrelated affordable housing solutions in the Logan Square eHub. We are targeting built environment decision makers and investors in the public, private, and civic sectors. We envision equitable, responsive, transparent decision making and investment, as part of a regional agenda for just, healthy, and climate resilient communities. a retention-focused policy agenda that embraces eTOD, climate resilience, and social determinants of health as core elements; and the systematic increase in capital availability and responsiveness to communities, including a streamlined coordination of existing capital sources. The Corridor Development Initiative (CDI) model of community engagement has been successfully tested in the 63rd/Cottage eHub, to involve residents in transforming the vacant Washington Park National Bank Building. 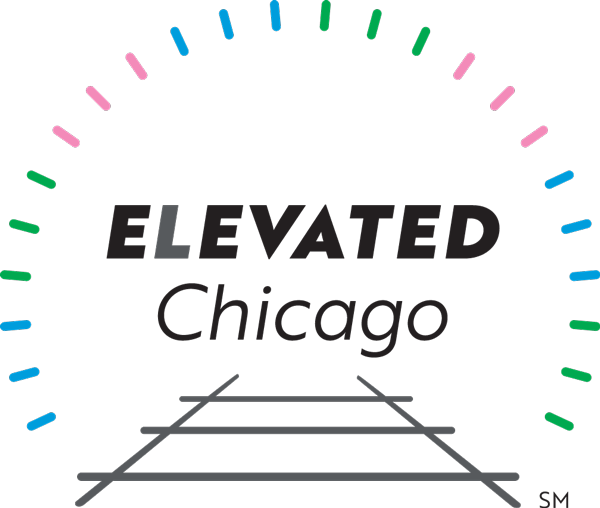 Elevated Chicago partners are working with SPARCC partners to develop a set of DEI trainings and tools, including a capital screen and survey to be used with all Elevated Chicago-sponsored projects in order to assess their impact on health, climate resilience, racial equity, and displacement. Through our Leadership Council — composed of city and regional leaders from government agencies, anchor institutions, and the private sector — we will advocate for the holistic adoption of these and other recommendations by decision makers and investors in the community development sector.